What's The Different Between Chest Cold And Head Cold? 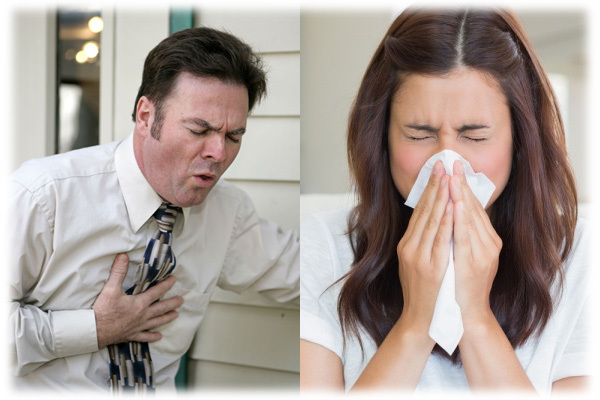 Home General Health What’s The Different Between Chest Cold And Head Cold? What’s The Different Between Chest Cold And Head Cold? You’re sneezing or you’re having a chest pain or you’re going through a running or closed nose; these all are symptoms of cold. Cold is basically divided into two parts on the basis of the organ they are affecting and they are chest and head cold. When you’re suffering from cold, the most common thing would be bad nose. With bad nose we mean running nose or facing breathing problems. But, these two cold are caused because of different reasons and are affecting different part of our body. Head cold is very common and people are basically affected by it during winter season. It is commonly known as ‘common cold’ and can go away by itself in 10 days. This doesn’t cause any harm to the body and basically gives you’re restlessness for the days you’re affected with it. It is actually a virus infection which gets settled in the mucus of the nose. Due to this settlement, you would find running nose, watery eyes and clean mucus flowing through your nose. Some might even have headache or feel unwell. Whereas, some might even get a horse voice as mucus is flowing through their throat. With time, the body would get rid of the virus responsible for the cause and it would return to the normal position. It is good that if one drinks lots of water especially warm. Also, the person suffering from this cold should keep him/herself in a warm environment. Like head cold, chest cold is affected in the different reason of the body. The virus when attacks the lower respiratory tract of the lung, a person feels difficulty in breathing and also fever. This is caused by the virus like influenza and it spreads from the upper respiratory system of the lungs to bronchi, a small passage inside the lunch through which the air moves when you’re breathing. It is considered as contagious disease. This can happen at any given point of the time in a year. Infants, young and old people are the group of people who can catch this cold, easily. Also, those who smoke, have lung disease or are exposed to pollution are also prone to have it. Chest can be treated with medicine but if not treated on time, it could lead to pneumonia, which is a very serious and life threatening disease. Its symptoms would include fever, chest pain, difficulty in breathing, loose wet cough that produces yellow and white phlegm, fatigue and chest congestion. Both the colds are caused by virus but the area they affect can make them life threatening or not. We normally think that cold will go with time or we are affected just because of the change in climate but if we neglect the small symptom of it could make this cold dangerous for our health. It is better that you know the symptom of both, head and chest cold, so that you can save your life and deal with it. So, next time you have a cold, don’t forget to visit a doctor to understand it in a better way and proper medication.